Home Healthy BabiesDiapering	Let Sleeping Babies Sleep! Sleep is vital to your baby’s health and growth—even their ability to think and learn. Help your baby get all the sleep they need by learning when to let sleeping babies keep sleeping. Healthy food. Vigorous exercise. Restorative sleep. These are essential to all human health—but did you know that babies have very different sleep patterns than adults? We adults need 7-8 hours of uninterrupted snoozing every 24 hours. On a good night, we go through 4 sleep cycles of some 90–100 minutes each. At the end of each cycle, we either wake up or drift back to an earlier sleep stage and repeat the cycle. Babies have only 2 sleep cycles, active sleep and quiet sleep. These cycles are short—only 50–60 minutes for the first 9 months of life before their sleep begins to change to be more like ours. Babies first drift into an active sleep cycle. As baby begins to snooze you may see baby moving their body, fluttering eyelids or hear baby making gentle noises. About half-way through one cycle, babies begin to transition to another. 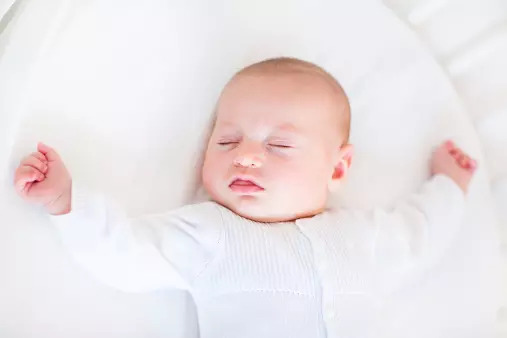 In quiet sleep, you’ll see baby’s breathing drop into a slower, rhythmic pattern, and they’ll have less body movement. In quiet sleep, babies are less likely to be disturbed by noises. Baby either wakes up from a quiet sleep cycle or transitions back to active sleep. higher-level thinking like problem-solving, to name but a few! Skills where movement and thinking are combined, like coordination and balance, are also affected by sleep. This includes both active and quiet sleep, which is why it’s important to protect baby’s sleep as much as possible. Avoid waking your baby unnecessarily. For example, put your baby to bed in a clean, dry and super-absorbent diaper with a wetness indicator. Only disturb baby if you need to change a soiled diaper. Protect baby’s sleeping environment so that noise doesn’t startle them awake. Some babies seemingly sleep through anything, while those who are light sleepers may need more support to block disturbances. Share your room, but not your bed, for their first year of life. Room-sharing decreases the risk of sudden infant death syndrome (SIDS) by 50%+! Because babies have unique sleep cycles, it can take months from them to begin sleeping through the night. The first 6-8 weeks are often the most difficult; some parents are convinced baby has night and day mixed up. This is an exhausting and overwhelming time in any parent’s life. 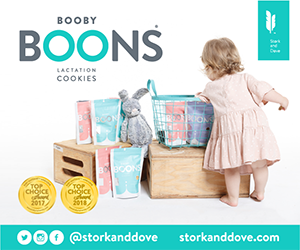 Promoting sleep takes time and patience as you discover your baby’s preferences and what works in your family. Avoid “sleep training” advice and systems—these are ineffective and some are downright dangerous for baby because they ignore the developmental aspects of baby’s sleep cycles with the goal of mimicking adult sleep. Your baby will naturally begin sleeping for longer periods—and yes, eventually through the night!—as they develop and grow. Minimize noise during sleep time, especially at night. Use light to emphasize the difference: During awake times, the lights can be on and sunshine can stream through the window. During sleep times, lights should be dimmed or off. Practice rituals, such as rocking, cuddling skin-to-skin or swaddling, to cue baby it’s time to doze off. Avoid playing with or talking to your baby during sleep time; shushing sounds are OK and relaxing. Diaper changes can also cue baby toward relaxation and sleep. During the day, when baby is awake and active, use a more lively approach to each diaper change; soften your tone and touch as nap time nears. Developing a sleep routine is just one part of your baby’s development; don’t rush it or stress over it. You’ll both make it through those earliest weeks, and benefit from the restorative sleep you both deserve once baby’s old enough and developed enough to sleep through the night. Sleep should be protected whenever possible because it plays a major role in brain growth and temperament development. In between sleep cycles, give your baby some time to fall back asleep on his own. Sometimes babies fuss but are able to get back to sleep by themselves, especially as they get older. Premature babies (born before 37 weeks) need extra sleep support. Sleep-deprived preemies may have more difficulty regulating their emotions and grow and learn at a slower rate. Research shows that parents and caregivers are key to helping preemie babies get good quality sleep. Watch for those things that help baby drift off to sleep. Some babies need a little time to soothe themselves; others need your help to calm down, relax and drift into sleep. Your baby may like sucking his thumb or need help finding and using his pacifier. The American Academy of Pediatrics recommends using pacifiers in all babies to reduce risks of sudden infant death syndrome (SIDS). If you baby’s pacifier falls out of their mouth after they’ve drifted to sleep, there’s no need to replace it. If your baby is in a NICU, your nurses will work with you to help cluster their needed care for baby during awake cycles, when possible, to protect baby’s precious sleep. As you tune in to your baby and respond to their needs, trust builds in your relationship and everyday actions. Protecting your preemie baby’s sleep helps optimize their growth and health for the long term. Source: Adapted from Huggies® Every Change Matters: A Guide to Developmental Diapering Care.